Fun Fact: My apartment is ROASTING HOT right now. I'm sure I've complained about this before, but since the landlord controls the heat in our building it's often way too hot and dry in here. So here I sit in December, with the windows open and shorts on, pretending I'm at the beach and lamenting the dryness of my winter skin. 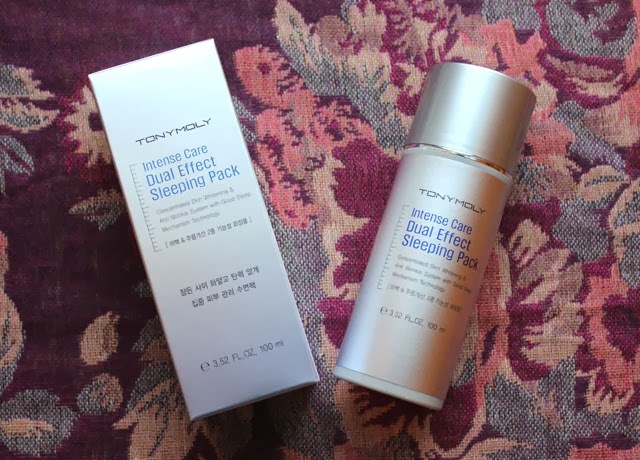 Unusually hot apartment aside, I'm sure I'm not the only one to experience dry skin in the winter, so I thought I'd talk about a moisturizing product I've really grown to love over the past year: Tony Moly's Intense Care Dual Effect Sleeping Pack. Concentrated Skin Whitening & Anti Wrinkle System with Good Sleep Mechanism Technology. This dual functional sleeping pack contains a wrinkle-improving functional ingredient of adenosine and a skin whitening functional ingredient of arbutin. It makes dull, sagging, and wrinkled skin young and healthy. 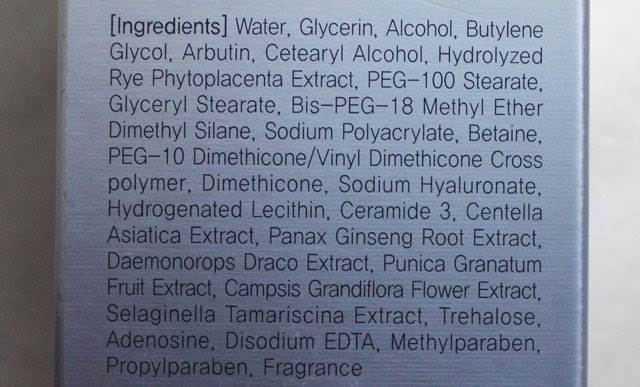 It should be noted that this product does contain cetearyl alcohol, which is a potential irritant for some. Personally I don't have problems with it, but if you have sensitive skin you may want to pick up some samples first - they're abundant on eBay. It's also fragranced, though the scent is very mild and not overpowering at all - just a vague floral "skincare" smell. Maybe you know what I mean. Hopefully. This sleeping pack comes packaged with a pump dispenser, which is super-convenient and will ultimately increase the shelf-life of the product (no dirty fingers contaminating it with bacteria). While this is not the best pump in the world (it sometimes takes a couple of tries to get the product out) it's certainly functional. First and foremost, I love this the Intense Care sleeping pack because it adds moisture to my routine without making me break out. This is extremely useful at this time of year - after all, the radiators are baking my skin while I sleep. 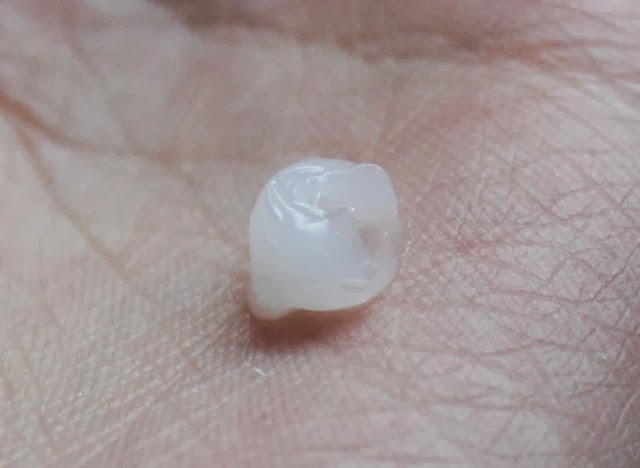 I only use this about once per week so I can't comment on whether or not this would have dramatic skin lightening effects with consistent use, but there have been a number of studies demonstrating the effectiveness of arbutin for those purposes, so you can research that topic if it interests you. Personally I feel like this pack does have a temporary "brightening" effect - my skin tone looks even after refreshed after use. Totally anecdotal I realize, but that's how I feel. I also feel like this product has a temporary skin plumping effect - is it because of the adenosine or just all the moisturizing goo in there? I'm not sure. But in any case, my face looks moist and fresh and not like a dried out husk after I use it. Some sleeping packs don't feel thick enough to me, which is an important consideration because I don't want it to dry up or absorb three seconds after I put it on. I think this pack has the perfect texture, though with that in mind it might be too heavy for someone with very oily skin... again, get samples first if you're not sure! 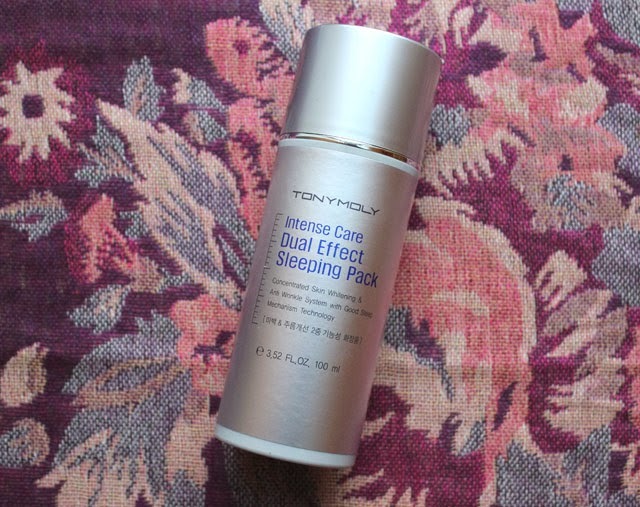 Bottom line: Tony Moly Intense Care Dual Effect Sleeping pack is a great way to add some moisture to your evening routine, plus it has potential brightening/anti-aging benefits. I would strongly recommend getting samples and doing a test patch first if you have really sensitive and/or oily skin. Where to buy: I got mine off eBay, where you can usually find it for around $15 shipped - check out my post about buying Asian cosmetics on eBay if you're looking for a list of reputable sellers. Sample packets of this product are also easy to find on eBay, and that may be a good place to start if you've never used it before. Do you use sleeping packs? How do you combat dry winter skin? Never tried this sleeping pack, but I love sleeping packs in general. This is really a useful review. I'll try to get some samples for this. I think I'm going to get this. 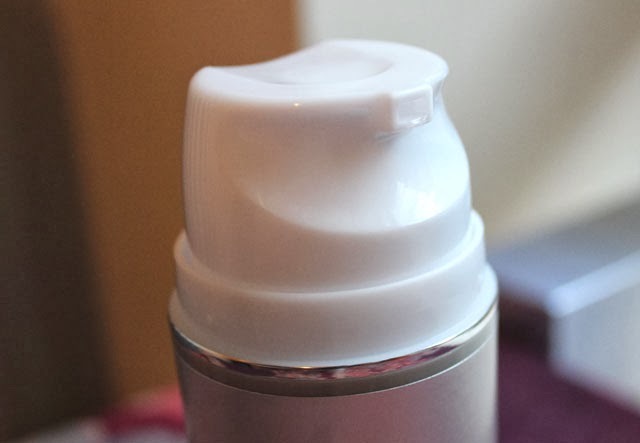 I've used the Laneige sleeping pack and didn't really love it. And this one is a quite a bit cheaper. That pack is definitely kind of expensive for what it is. I hope you like this one better! I can really relate to the shorts and open windows in December! Our heat is controlled by the landlord too, and sometimes it is freezing cold (like right now!) and others I'm sweating while it's snowing outside. It does less than wonderful things to my skin! I have never heard of a sleeping pack before. I have very dry skin this time of year and that sounds great! Your blog is wonderful and always so helpful. Thanks!